Bakkies are really versatile vehicles. As time goes by, they just seem to get better. In the case of a double cab, this is especially true. The passenger cabins of these trucks are almost car-like in design, and many of them feature an abundance of luxuries that were unheard of even in luxury sedans not so long ago. Add to this the advantage of a lofty perch from which to observe the lesser mortals in their sedans and little runabouts, and one can begin to see why the likes of the Hilux and Ranger regularly top the vehicle sales charts. If you are an outdoors type of family, there are very few arguments against owning a double-cab pickup. With the versatility of a load bin out back, which in many cases can carry up to a ton of stuff, it’s hard to see why you would not opt for one of these as a family vehicle. There is, of course, one glaring issue which is a problem in many cases. The load bin is exposed to the elements, both natural and criminal. Tonneau covers are fine for keeping your load dry but won’t keep the contents safe from criminal elements. Should you opt for a tonneau cover, packing space will also be limited to the height of the load bin. Enter the canopy: an additional hard shell to cover the rear bin, often with windows and a lockable door to keep your gear safe and dry. Traditionally, canopies were made of fibreglass. Many top-of-the-range fibreglass canopies are beautifully styled examples which, when colour-coded, can make a double-cab bakkie look like an SUV wagon. For everyday use and mild off-roading, these canopies are fine, provided you choose a quality option. However, for serious overlanding, the traditional fibreglass canopy does have a couple of shortcomings. Most local canopies feature side windows that slide. This does not allow easy access to the very front of the load bin, or for the loading and unloading of larger items through the side windows. Although some fibreglass canopies are reinforced, the majority have rather limited weight-carrying capabilities on the roof. They also tend to be vulnerable to criminal elements, as the glass makes your possessions visible, and can be smashed – a problem when on safari in more challenging parts of Africa. Some years ago, I noticed a canopy that looked like a fibreglass unit but was actually manufactured from stainless steel. It looked very good, but at the time was exceptionally expensive. Due to its design, it did offer better loadability on its roof than the fibreglass designs, but still did not offer side access. Some upmarket canopy manufacturers in Thailand use thermoplastic designs which feature an integrated metal frame moulded into the plastic shell. A precise, machine-controlled mould is used, giving the canopies a more upmarket look − and feel − than the traditional fibreglass option does. After the USA, Thailand is the biggest manufacturer of bakkies, and there is a vast market for bakkie accessories, especially canopies. In early 2001, I was visiting my mate Chris Ingram from R&D Offroad down in Cape Town, and met his (then) plumber buddy, Jeremy Bergh. Jeremy was sharing a small factory unit with Chris and was busy putting together a box-shaped canopy made of aluminium for his pick-up. This was, of course, the start of Alu-Cab. Jeremy had the same issues with conventional canopies as I have mentioned previously. His new design would cover a lot of bases and essentially make overlanding easier. The aluminium construction was strong, and allowed for enhanced load-ability on the roof. 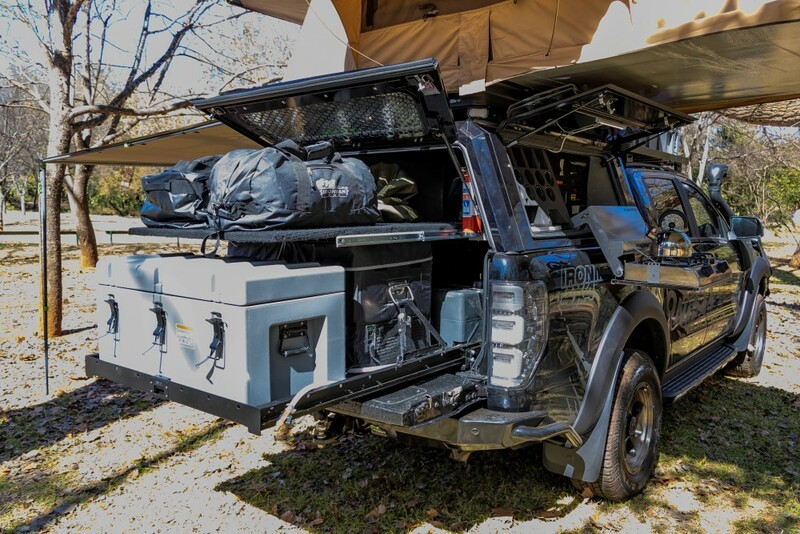 The sides of the canopy featured lift-up doors on either side for easy access to any part of the canopy interior − no more clambering up on the tailgate and crawling into your canopy on your knees. The side doors could be had with, or without, glass; and the rear door lifted up like a conventional fibreglass canopy. For Jeremy, the next step was to fit cupboards against these doors on the inside, featuring places for kitchen utensils, groceries, etc. These cupboards were half the length of the side door, so that there was still enough access to the front part of the canopy from the side. Alu-Cab were pioneers of this type of canopy, and Jeremy’s idea has given rise to a whole industry of metal touring-style canopies. Materials have also included the use of stainless steel, as in the case of RSI canopies. It was around this time that I was driving my old Hilux solid-front-axle double cab. On my return to Johannesburg, and because I was without the financial means to buy one of Jeremy’s beautiful creations, I proceeded to knock up my own home-made aluminium canopy. It was certainly nowhere near as good-looking as the Alu-Cab product, but it was functional, and worked a treat. Today, there are many fantastic home-grown canopy products available here in SA − one of the best examples of South African ingenuity in the 4WD industry. Many of these products are exported to far-flung corners of the world and it is something that we can truly be proud of. 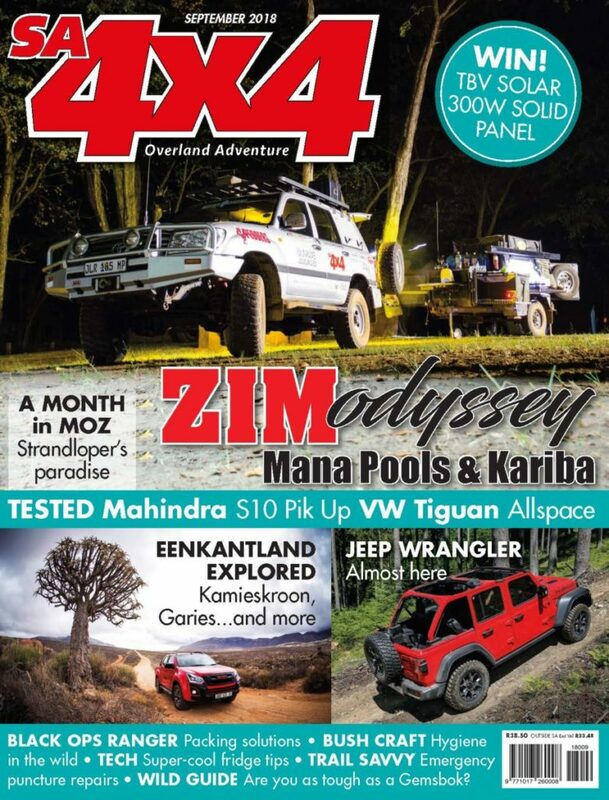 It was therefore fitting that we would choose a South African product as the canopy for our Ironman 4×4 bush truck. A quick Google search reveals an abundance of aluminium canopies available locally − I visited more than 30 different websites offering various shapes and sizes. It was interesting to note how a couple of the lesser-known products were blatant copies of the established bigger brands, but most of the products on offer looked great on their website images. At the end of the day, it came down to a choice between two innovative market-leading products. It was a very, very tough decision. I like both products and I know the owners of both businesses well. Jeremy from Alu-Cab is just a great all-round 4WD and touring guy, and he is, after all, the Aluminium Canopy Pioneer. Jeremy’s Alu-Cab story is one of perseverance and ingenuity, going from humble beginnings to becoming the market-leader in aluminium canopies. The Alu-Cab product offering has expanded vastly, to include piggyback camper units of various configurations, rooftop tents and 270-degree awnings. I would have loved to have an Alu-Cab canopy and awning on our Bush Truck, but things just did not pan out as planned at the time. That may, however, be rectified midway through the life of our bush truck. Watch this space. I met Mike Voss, owner of Rock Solid Industries (RSI), just over a year ago while visiting his canopy factory in Pinetown on the recommendation of the guys from Nissan SA head office. Mike’s RSI stainless-steel canopy had recently been approved by Nissan SA for fitment to the (then) newly-launched Nissan D23 Navara pickup. 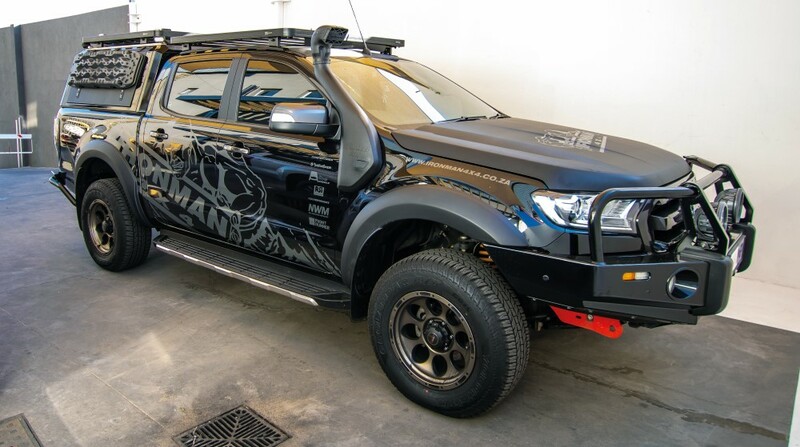 Our Ironman 4×4 products were also approved by Nissan SA; and, to support the program, we purchased a new Navara to join our Ironman 4×4 fleet. 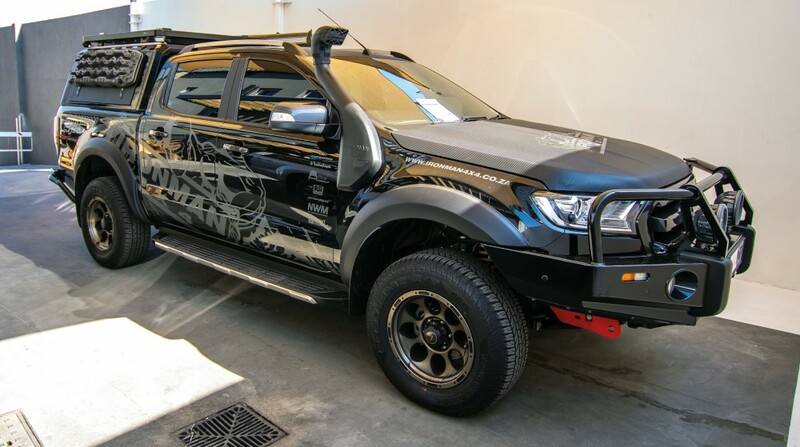 It was only fitting that we should instal an RSI canopy to this Ironman 4×4 Navara, as this vehicle would be used by our Nissan sales rep when visiting Nissan dealerships. I liked the look of the canopy on the Nissan. It was during this factory visit that I realised I would be fitting a RSI canopy to the Black Ops truck. I have been to several production facilities in my time, including vehicle manufacturers, and the RSI facility struck me as being OE quality throughout. 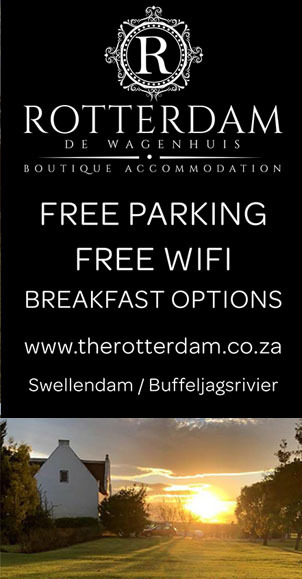 This is in line with the fact that RSI canopies are officially approved by just about every vehicle manufacturer in SA. Mike’s products are rigorously endurance-tested before production release, which sets the RSI canopy apart from just about every other product on the market. The RSI paint shop looks like a mini Toyota paint shop. Mike’s story is as intriguing as that of my mate Jeremy. 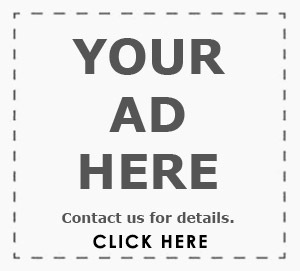 Just a decade ago, Mike was selling mobile bakkie linings from his pickup, trying – like most of us – to make ends meet. An opportunity, plus hard work, endurance and ingenuity have brought Mike and his product to the forefront of stainless-steel canopy production. I have a sneaking suspicion that, like me, Mike may suffer from a certain level of OCD. His attention to detail is profound – it shows in the quality of the product, in the RSI production facility, and clearly in the way in which Mike runs his business. 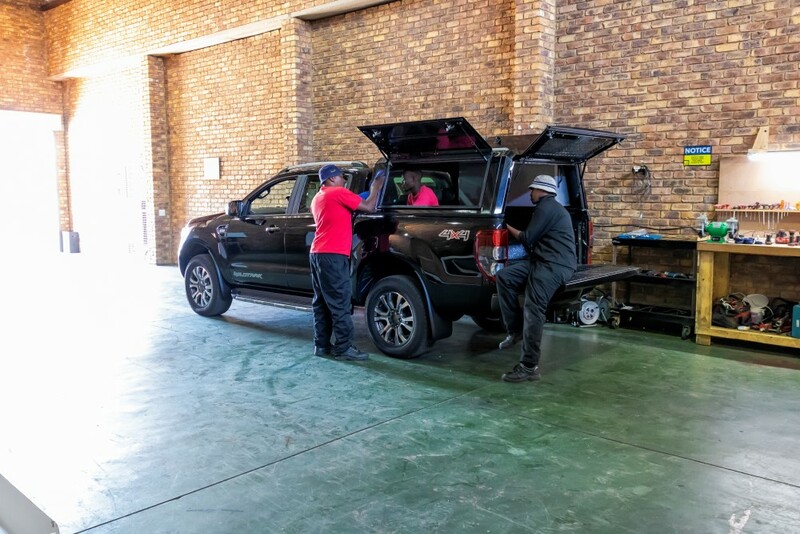 RSI supplies work-style canopies to a number of large corporate fleets including Telkom, and this allows a huge amount of data to be gathered from field experience, all used to enhance the product on an ongoing basis. So, an RSI canopy in ‘Panther Black’ was ordered and fitted to the Black Ops truck by the RSI fitment centre in Johannesburg. The fancy Wildtrak sports bar spoiler over the load bin had to be removed. This is a substantial assembly and I was sorry to see it go, but I certainly had no use for it. Another Wildtrak standard fitment was a drop-in plastic moulded bin liner. This product is very popular in Australia, where the Ranger was mostly developed. It covered most of the load bin surface, but not the inner tailgate. Here in SA, we prefer the spray-on type of urethane linings, and I am a fan: so the drop-in plastic liner came out as well. RSI offer a number of accessories for their canopies, some of which are essential to any touring truck worth its salt. On the driver-side of the canopy, a full RSI kitchen unit was installed. This unit features crockery and cutlery for four people, including a two-plate gas stove which folds out and is removable – along with a stainless-steel kettle, scissors, quality salt & pepper grinders, a corkscrew, steak knives, forks, dessert spoons, teaspoons, braai tongs, a stainless-steel spatula, a wooden Spoon, a bread knife, mugs, plates and bowls. My favourite feature of the RSI kitchen unit is the fact that it comes with real glass tumblers and wine glasses. I’ve never been fond of drinking my beer or whiskey out of a steel “glass”. This kitchen unit takes up the entire length of the canopy, which prevents you from accessing the inside of the canopy towards the front on that side. Having weighed this up, I decided that I would fit another similar gull wing box to the other side of the canopy, to use for the electrical installation and general storage. I would now no longer be able to access the front portion of the inside of the canopy from either side. I did, however, have a plan to remedy this − which I’ll come back to later in this story. Suspended from the roof of the canopy is a large stainless-steel table. Unlatching either side of a frame drops it down at an angle, and allows you to slide the table out. It is a nice large table, offering ample food-prep surface. Several neat LED light-strip fittings are fitted in the side boxes as well as in the roof at the rear of the canopy, supplying ample low-power lighting. If there is any criticism that I could level at the RSI canopy, it would be that it does not feature a high-level brake light on the rear. I feel that this is a glaring omission, as it is a safety item. The RSI canopy is mounted to the Ranger load bin by means of four substantial custom-made brackets specifically designed for the Ford. The upper surfaces of the load-bin sides are not flat, but feature a slight curve which bows upwards in the middle. Clamping a perfectly flat canopy down onto these curved surfaces can lead to cracking of the canopy, or, worse still, of the Ford load bin. This is, in fact, what happened early on in the life of many Ranger load bins, prompting Ford to develop and release these special brackets as a compulsory item when fitting any canopy. It is interesting to note that the canopy is securely mounted to these brackets, allowing for a medium amount of squeezing of the rubber moulding between the canopy and the load-bin mounting surface. This creates a better dust seal and ensures a longer life for the dust seal – as opposed to squeezing the hell out of it. The side and rear canopy doors each feature two high-quality gas struts along with new-style locking mechanisms, all lockable with the same key. The rubber seals around the doors are substantial, and I can confirm that (thus far) the canopy is very dust- and waterproof. I absolutely hate dust all over my overlanding gear, so I was also keen to dust-proof the rear tailgate area of the Ranger. 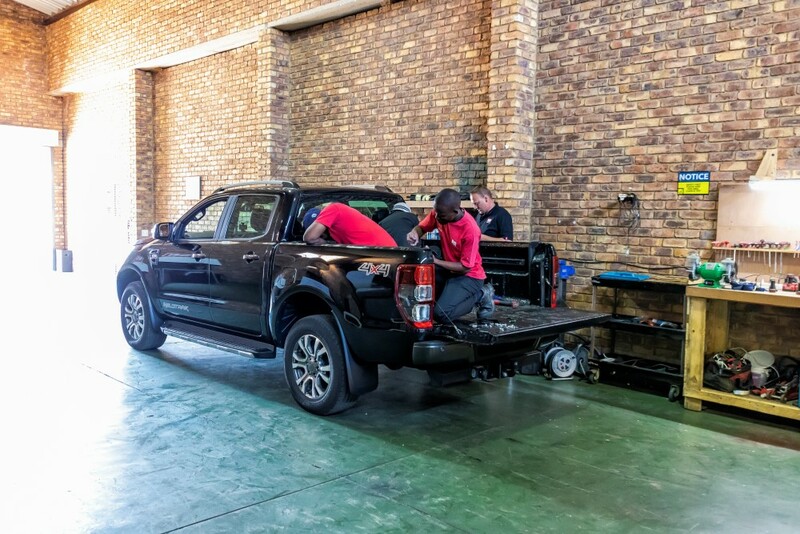 A company called Bushtech canopies do a dust-proofing kit for the rear of most of the popular bakkies, and I took the Ranger to their factory in Broadacres. They mounted slim metal panels on either side of the rear aperture of the load bin that fit up snugly against the tailgate when it is closed. (These panels feature thick rubber seals as well as copious amounts of quality black sealant.) Bushtech do not stop there, though. They proceeded to apply this sealant to every nook and cranny in the load bin. Despite the urethane bakkie lining, there are gaps and holes all over the place, and sealing the rear tailgate is only half the job. I was really impressed with the job, and I’m very glad I took the time and effort to visit them. Speaking of the tailgate, dropping it open and lifting it to close can be a bit of a chore, even more so if you are of slight build like yours truly. Fortunately, there is something that makes light work of that heavy tailgate, called the ProLift Tail Gate assist kit. The kit consists of a set of brackets and springs that are installed on either side of the lower part of the tailgate in the vicinity of the hinges. Added to this is a small gas lift strut that mounts on the right-hand-side of the tailgate. There was no drilling required, and installation was pretty straightforward. The results are excellent. Pulling the latch and letting the tailgate drop open under its own weight, results in a smooth glide. The tailgate feels like it is made out of featherweight aluminium and can be closed using one hand, with very little effort. A very worthwhile addition to the Bush Truck. There is no place under the bonnet of the Wildtrak to fit an auxiliary battery in the engine bay. (I’ll cover this next month when we cover the electrical installation in detail.) The auxiliary battery would have to be fitted somewhere in the rear load bin. It would have to be accessible to be serviced or replaced. With the kitchen unit on one side, and the Gull Wing box on the other, I had to fit the battery towards the rear of the load bin, as it would not have been easily accessible if mounted towards the front. This worked out fine, and the battery was mounted on the left-hand-side of the load bin behind the wheel arch. It was mounted in a Front Runner battery box, which was, in turn, bolted down into Rivnuts located through the load bin floor. Front Runner products feature prominently on the Ironman Bush Truck. They have, among others, a fantastic storage program covering many areas, including roof racks and drawer systems. The modular nature and magnitude of their roof-rack accessory program is second to none, and I have only ever had great results when using their products. We cured the inaccessibility of the rear load bin of the Bush Truck with a full-length Front Runner Load Bed Cargo slide. The slide for the Ford Ranger fits snugly between the wheel arches and fills the length of the load bin, front to rear. The slide is a slim-line design which I preferred to a conventional drawer system set-up. The drawer system would still make it hard to get to the area on top of the drawers towards the front of the load area, but with the slide, everything is reachable. When not touring, the slide does not have anything on it, and (to all intents and purposes) the entire floor area of the load bin is available to use. When I am touring, the slide holds a rectangular 70-litre water tank fitted across the rearmost third of the slide. In front of the water tank is a dual compartment Ironman 4×4 fridge. This fridge can be configured to have two fridge compartments, or one fridge and one freezer, or both freezers. The fridge takes up the middle third across the slide. The front third of the slide is occupied by a 140-litre Ironman 4×4 Maxi Touring Case. These lockable touring cases are very tough and have dust- and waterproof seals under the lid. This configuration pretty much covers the floor of the load bin on the slide and fills the lower 600mm of the load bin from front to rear. The upper half of the canopy is still empty space, and rather difficult to fill. Anything put on top of the storage box, fridge or water tank hampers access to these, and may roll off to the side, or in-between them. With the two gull-wing boxes attached to the inside of the canopy side doors, the rear panels of these boxes face each other. This gave me the opportunity to fit a flat shelf between these surfaces at a height that just clears the fridge − one of the few home-made pieces on the Black Ops truck. I used 16mm MDF plank, cut to size, and covered in heavy-duty carpet all round. This shelf is purely for carrying soft bags with clothes, sleeping bags and pillows, and perhaps a pair of lightweight camping chairs. The shelf slides on heavy-duty Reponi sliders from Repon. These are the only ones to use for anything that slides. The clothing bags, chairs and other lightweight items are now out of the way of the bottom slider, and can be accessed very easily by sliding out the upper shelf. Access to the fridge and storage box is thus unhindered, and there is no need to unpack anything to get to food or a cold beer. The entire section under the canopy shell is now more-or-less utilised. I am still young enough to enjoy the virtues of a roof-top tent without too many issues in getting up and down the ladder. There is also a certain level of contentment in knowing that it is harder for predators to get to me up in the roof-top than in a conventional ground tent. My Ironman 4×4 Roof Top tent takes pride of place above the RSI canopy on the back of the Bush Truck. At 1.4 metres wide, the Ironman tent gives slightly more elbow room than a standard 1.2-metre-wide unit. Another great feature is that the tent access door is covered by an extended flysheet, which means that I don’t have to emerge from the tent directly into rain. In fact, the access door can be left open to promote airflow and only the insect screen zipped up during hot weather. The RSI canopy roof features two aluminium profile tracks mounted on either side near the edges, running front to back. These tracks are very similar to the Front Runner roof-mount tracks, which makes fitting their load bars and roof racks a cinch. So, the Bush Truck has a 1.4m Front Runner Slimline roof rack mounted to the top of the RSI canopy by means of four Front Runner low mount roof-rack feet. 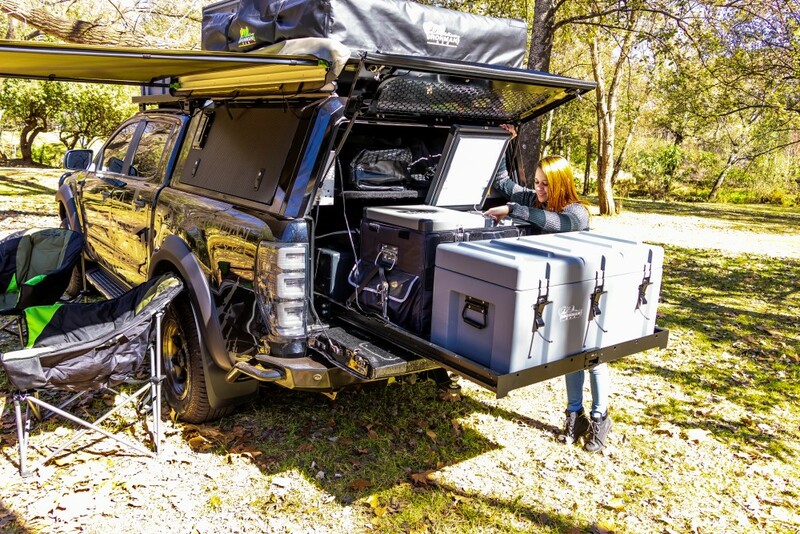 Fitted to the roof rack is the latest innovation for roof-top-tent mounting – the Front Runner Quick Release tent-mount kit. Four brackets with large studs are fitted to the bottom of the Ironman 4×4 roof-top tent. These studs slot into the four quick-release brackets that are mounted to the Front Runner roof-rack. Mounting and dismounting the roof-top tent takes mere seconds. The Quick Release brackets are lockable. It just does not get easier than this. I am the lucky recipient of a gene pool that includes many things which are – at times – great, and, at other times, well… not so great. I have long since lost the flowing locks that I sported when I wore a younger man’s clothes, and, in recent times, I search for good shade when the sun is out. So I, for one, am very grateful for the Ironman 4×4 Easy Out awning. 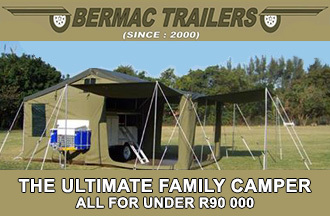 It is a simple “roll-it-up yourself” awning, of canvas 2.0 metres wide by 2.5 metres deep. It has adjustable poles with securing ropes for when it is windy. It has a neat 1.2-metre built-in LED light strip that can be plugged into a 12V power socket inside the vehicle, which gives you shade during the day and a convenient light when the sun sets. Although some may find the manual mechanism of the awning tedious, there is nothing that will break or go wrong. The awning is encased in a heavy-duty vinyl bag that fits snugly against the side of the roof rack. The awning is mounted to the Front Runner Roof Rack by means of custom brackets specifically designed to suit the Easy Out awning. The aforementioned storage layout of the Ironman Bush Truck did not take into account the fact that I have not been a single man for just on a decade, and having a wife and an eight-year-old son when touring does pose potential packing problems at the best of times. So, I elected to remove the roof rails that are standard fitment on the roof of the Wildtrak, and fit an additional Front Runner roof rack. This rack is just shy of 1.4m long, and is the perfect base for carrying two of our 140-litre Ironman 4×4 Maxi touring cases. Another option is a 500-litre Ironman 4×4 Cargo Bag, which can be strapped down to the roof rack. The Front Runner racks are slim in design and feature an optional wind deflector. I am happy to report that there is almost no wind noise from the rack on the roof, but this may be due to the extensive sound-proofing that we fitted during the sound upgrade. More on this at a later stage. Our Bush truck now has a safe, dry, lockable, and – most important – dust-free rear cargo compartment, with enough facility and storage. With a collapsible bedroom above the canopy, an awning for shade on the side, and additional space for cargo on the cab roof, our Bush Truck is almost ready for its first sojourn into the wild. Two more important facets of any Bush Truck worth its salt remain, and in the next issue we’ll be looking at one of the most difficult of these to get right – power management.